In collaboration with renowned relapse prevention Terrence Gorski, Dr. Newport is developing a series of client-oriented workbooks focusing on key aspects of wellness and recovery. These workbooks are ideal for application in treatment settings for use in both group work and individual counseling. Each workbook is accompanied by an Instructor's Manual that provides detailed guidelines for using the workbook in clinical settings. 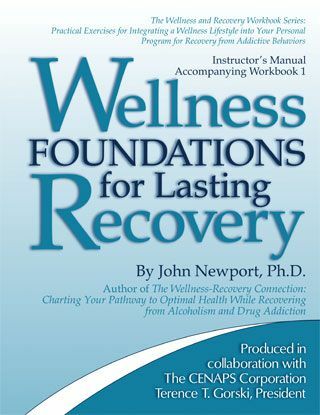 This workbook introduces treatment clients to basic principles of wellness and recovery and motivates them to integrate a wellness-oriented lifestyle into their recovery. Topics include: wellness and its importance in your recovery, positive and negative addictions, and applying the tools of wellness in early recovery and relapse prevention. For further information or to order this workbook, Click Here. This workbook is designed to educate clients concerning the importance of nutrition in laying a solid foundation for their recovery. It motivates them to identify strengths and weaknesses associated with their current eating patterns, and provides guidance in making a conscious transition to a health-conducive diet that is fully supportive of lasting recovery and optimal health. Topics include: basics of nutrition and recovery, nutritional hazards accompanying substance abuse, establishing a strong nutritional foundation for recovery, and transitioning to a healthy diet. 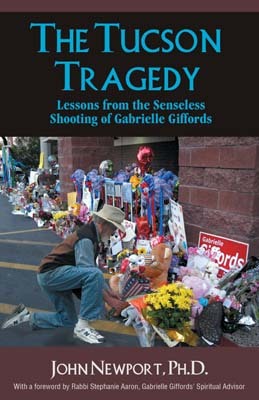 Living just one mile south of the site of the tragic shooting of Arizona Congresswoman Gabrielle Giffords and 18 others on January 8, 2011, Dr. Newport began writing this book the next day. The Tucson Tragedy is a fast-reading, riveting book that portrays the human side of this horrific shooting - together with the ensuing wave of healing that continues to permeate both Southern Arizona and our nation, and the lessons to be learned. "Dr. Newport does an excellent job of portraying the creation of a community of healing out of the ashes of this tragic shooting." From the foreword by Rabbi Stephanie Aaron, Gabrielle Giffords' spiritual advisor. For further information on this definitive documentary of this earth-shattering event and its aftermath, or to purchase the book, visit www.healingtucson.net.